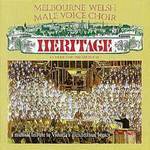 Victoria's 19th-century architectural heritage is explored in song. Presents the superb acoustics of Victoria's best colonial-era buildings: Como, Rippon Lea, The Old Melbourne Jail, and the fine Welsh churches at Melbourne and Maldon, all classified by the National Trust. Includes 'Amazing Grace', 'Welsh Lullaby', 'Men of Harlech', 'L'il Liza Jane' and 'Rhythm of Life'.